When Carol Milford, a young, liberated woman from St. Paul, Minnesota, marries small-town doctor Will Kennicott, she suddenly finds herself transplanted to Gopher Prairie. Horrified by her new home, an ugly backwater community, she decides it’s time the town made a few changes. The story of an idealistic young woman’s frustrated attempts to change the set ways of her small town, Main Street has been hailed as one of the essential literary satires of the American scene. An allegory of exile and return, it attacks the complacency and ingrown mores of those who resist change and are under the illusion that they have chosen their tradition. The lonely predicament of Carol Kennicott, caught between her desires for social reform and individual happiness, reflects the position in which America’s turn-of-the-century “emancipated woman” found herself. Sinclair Lewis’ cutting portrait of the small-minded inhabitants of small-town America is rich with sociological insight that still resonates today. When Carol Milford, a young, liberated woman from St. Paul, Minnesota, marries small-town doctor Will Kennicott, she suddenly finds herself transplanted to Gopher Prairie. Horrified by her new home, an ugly backwater community, she decides it’s time the town made a few changes. The story of an idealistic young woman’s frustrated attempts to change the set ways of her small town, Main Street has been hailed as one of the essential literary satires of the American scene. An allegory of exile and return, it attacks the complacency and ingrown mores of those who resist change and are under the illusion that they have chosen their tradition. The lonely predicament of Carol Kennicott, caught between her desires for social reform and individual happiness, reflects the position in which America’s turn-of-the-century “emancipated woman” found herself. 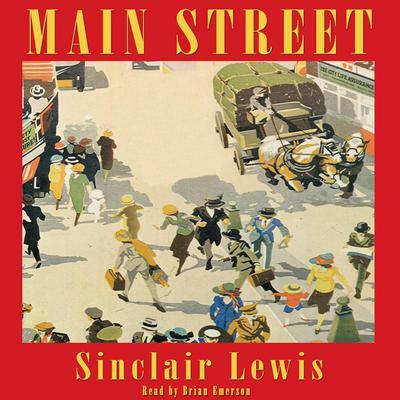 Sinclair Lewis’ cutting portrait of the small-minded inhabitants of small-town America is rich with sociological insight that still resonates today.